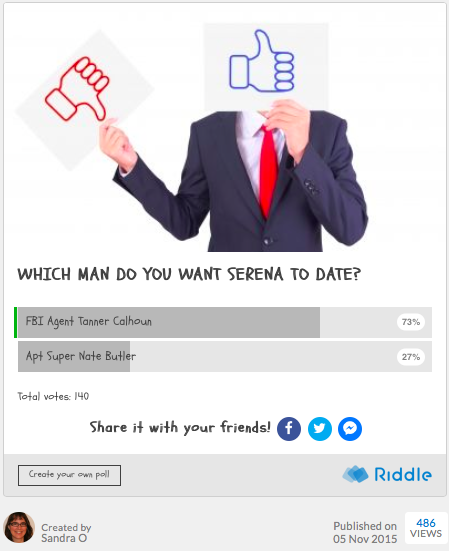 If you’ve read any of the Serena Jones mysteries, cast your vote for your favorite man in her life. Feel free to add a comment, too. Hmm, this is a static image of the voting grid I used to have here. Ten years older than Serena, Tanner Calhoun is a dedicated agent, quick-witted and protective. Nate Butler is an easy-going animal lover, who shares Serena’s love of art, a well-brewed cup of tea and old movies. Please Note: The final book in this series, Over Maya Dead Body, has now gone to my publisher (releases summer 2017), so although your vote can no longer influence it’s outcome, I’d still love to read your comments! Team Tanner! 🙂 He just seems more down to earth and “real” to me! And the way he teases Serena and pushes her buttons- so fun to read! Thanks Sarah, it was fun to write too! Tanner all the way!! He would be a awesome boyfriend to have!! I just read the first book, and it seems like your favorite is Tanner, and he comes across as a great choice. Nate almost seems to “vanilla,” though is likeable enough to keep me guessing. Can’t wait to see how it turns out! Interesting that you should think so. I had two critique partners during the brainstorming stage, each favouring the opposite guy and urging more page time for their favourite. That’s great! Glad they both have a wide appeal. I do not think Nate is “vanilla.” Mate seems very interesting and has several things in common with Serena, but I think Tanner would be a better match in the long run. Who wouldn’t want a great looking, down to earth guy with very expensive art and alarm system in his apt? Aunt Martha insinuated Nate is a millionaire too! The muscle bound guys like Tanner whom I have known break down in their 70’s and get needy. Nate would be steady as a rock! Don’t recall Tanner asking Sandra to the Blues game. Remember her Dad gives the tickets to Tanner. Tanner should have asked Sandra to go with him IF he were really interested. Agreed! If Tanner were interested in Serena, he should have asked her to go with him. I’m torn because Tanner seems such a tender/tough guy and handsome to boot. They share their love of solving the cases, but I’m not sure he wants to be her man, maybe just enjoying the relationship they have. I love the mystery of Nate and who he really is. I can see them enjoying a lifetime of shared interests, travel and adventures! I can see you’ve given this a lot of thought. So neat to see. 🙂 Too more books and you’ll find out who she chooses. 🙂 Then…if you like, you can join the private Facebook group I created where readers can talk about the ending and ideas for future books or whatever, without concern for spoilers. Nate, definitely. She needs balance in her life. When she finds out who killed grasndpa, her mommy hormones will kick in and Nate and vshe share many important interests.Besides, even if she continued to be an agent, he would be great to come home to. Oh I fell in love with Nate.